WWE '12 released on November 22, 2011 for the Wii with a MSRP of $49.99. The game was developed Yuke's Future Media Creators, and published by THQ. It received an ESRB rating of "Teen" with "Blood, Language, Mild Suggestive Themes, Violence" listed as content for gamers and parents to be aware of. How many hours have Wii owners reported wrestling in the digital rings of WWE '12, with 181 days of game-play reported? Let's take a look! Can you name all the wrestlers above? How about the ref (or is he just a "stock" ref)? 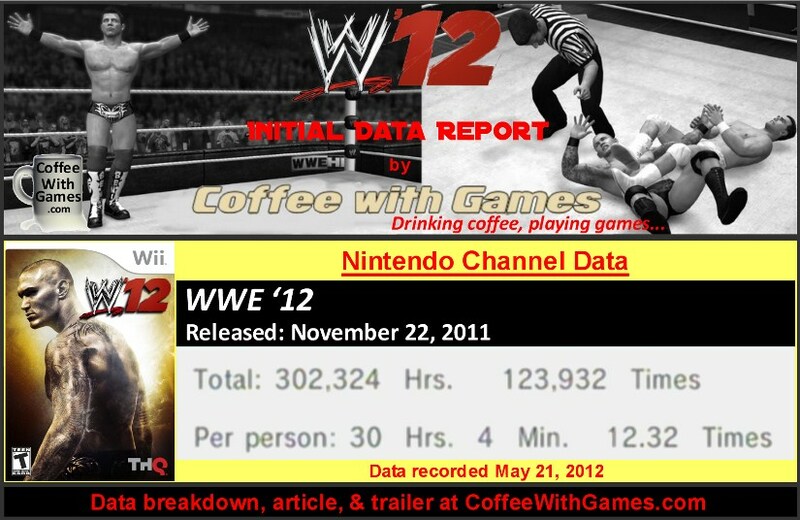 WWE '12 has approximately 10,059 U.S. Wii owners that have reported game-play data since the game released last November, and the game's average play-time per day/session reported is 2 Hours 26 Minutes. The game's average play-time of 30 Hours 4 Minutes "Per person" is more than some Wii games that debuted nearly 2 years ago, which I think shows the replay value of WWE '12 is pretty high. WWE '12's Wii "professional" review score average is 73.00%, based just on 3 reviews from GameRankings.com. The game's customer review score average is 78.09%, based on 21 customer reviews from Amazon.com. I have not played a wrestling game in a long time, probably close to 10 years now. I spent many, many, MANY hours on the Nintendo 64 playing both WCW vs. NWO wrestling games though, and I still own WCW vs. NWO Revenge. While I haven't played any of the more recent wrestling games, as I don't really follow/watch wrestling anymore, if the game-play formula has stayed the same in the new games, I can imagine they would be a lot of fun for wrestling fans. While THQ is "wrestling" financially right now, I think it is interesting that it has had the wrestling game licenses since back during the N64's days. I hope that THQ is able to correct the financial issues it has been having, and hopefully keep creating great wrestling games for current wrestling fans. If anybody at THQ is reading this, I personally would love to see the WCW vs. NWO games updated in some fashion, perhaps in another "Legends" type game, with the older wrestlers and combat system of the original games (not sure how that license would work though, since WCW isn't around...and there isn't the N64 controller button setup). Have any of you played WWE '12 on the PlayStation 3, Wii, and/or Xbox 360? If so, what do you think of the game? If you are a wrestling fan in general, and have played the games throughout the years, did WWE '12's new "Predator Technology" make a big noticeable difference in the game, if you played the older versions as well? Also, if you have watched wrestling any over the years, do you have a favorite finishing move? Currently in our house, it would be the powerbomb! I tried my very first WWE game with last year's one on the PS3 and it blew right over my head. The combo system, the way the engine works... none of it made much sense to be - but then I didn't play them when they hit mainstream popularity on the first gen 3D consoles. WWE 12 was a nice change in branding for the future of the series, unfortunately I hate the grappling system. It is realistic in the sense that you can only perform weaker moves early on with heavier attacks coming as you wear down your opponent, but it's kind of boring.